Hopkinton, MA (1/9/18) – ClearGov, a leading municipal transparency and benchmarking platform, announced today that former Maryland Governor, Martin O’Malley, has been elected to ClearGov’s board of directors. O’Malley served as Governor of Maryland from 2007 to 2015 and previously served as Mayor of Baltimore for eight years. O’Malley is widely recognized for his innovative approach to data-driven governing and has earned a reputation for pragmatic and effective governance via analytics. Utilizing publicly available data, ClearGov has built nearly 40,000 infographic profiles of local governments and school districts. 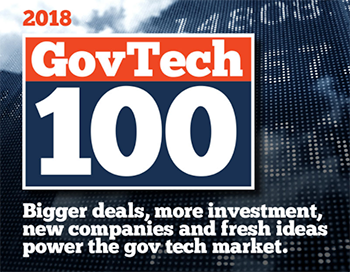 Hundreds of local government agencies leverage the ClearGov platform to increase transparency and gather financial insights through the company’s sophisticated municipal benchmarking tools. O’Malley graduated from Catholic University, and went on to earn his law degree from the University of Maryland in 1988. That same year, he was appointed as an Assistant State’s Attorney for the City of Baltimore. Driven by the epidemic of crime, drugs, and poverty that he witnessed as a lawyer, O’Malley ran for Baltimore City Council at the age of 28, where he served for eight years. In 2007 O’Malley was elected Governor of Maryland and brought his analytical prowess to the state house by establishing StateStat. The widely-acclaimed program measurably improved the performance of government workers, improved water quality and deterred crime. Under O’Malley’s leadership, Maryland’s school system became the top public school system in America for five years and the US Chamber of Commerce ranked Maryland the best state for innovation and entrepreneurship for three years in a row. Dozens of cities and states across the country have since adopted similar programs. To explore ClearGov’s local government transparency and benchmarking platform visit http://www.cleargov.com. ClearGov transforms city and town financial statements into accessible, easy-to-understand infographics to help citizens better understand how their tax dollars are being put to use. Local governments use ClearGov’s SaaS solutions to reduce operational inefficiencies, make informed budgetary decisions and improve communication with citizens. ClearGov founder and CEO Chris Bullock spoke about the origins of the company and its growth as a provider of transparency tools for governments during a segment of The Bloomberg Baystate Business Hour with anchors Tom Moroney and Peter Barnes. Bullock explained how his frustration over the lack of clarity in his town’s annual report provided the impetus to create tools that enable local governments and school districts to share where their local revenues come from and how they are spent. In the past two years since Bullock started shedding light on local government finances, ClearGov has translated publicly available data into easy-to-understand infographics for every city and town in the country (more than 36,000 government profiles). Hundreds of local governments and school districts are now leveraging ClearGov’s platform to share details on vendor payments to residents and to help them analyze how their spending on specific services compares to surrounding communities. In an era of growing skepticism about government, Bullock said ClearGov offers officials an important opportunity to be totally transparent with residents about tax and spending decisions and to help build community support. Hopkinton, MA (10/2/17) – ClearGov, a leading municipal transparency and benchmarking platform, has expanded its platform to include financial performance rankings of over 36,000 municipalities. The company has also introduced state government fiscal analyses, which benchmarks state budgets. The newly introduced rankings are built upon the breadth and scope of the ClearGov Insights™ national database, the world’s most comprehensive collection of government finances. ClearGov now offers per capita rankings for hundreds of categories including taxes, total revenue and spending on education public safety and employee benefits among other categories. The rankings, which can be filtered by county and population, also provide insight into demographic categories such as population growth, median home value and household income. In select states, ClearGov also offers testing performance, per pupil spending and teacher salary rankings on local school districts. ClearGov’s new state budget analyses not only provide taxpayers with a straightforward view of where states derive funding and spend tax dollars, but also benchmarks every budget category against contiguous states. Over the past two years ClearGov has gathered financial detail on nearly every city, town and village across the United States to create the world’s most comprehensive municipal financial database. The ClearGov Insights™ database now includes over $2.5 trillion in government spending across hundreds of budget categories. Hundreds of towns, cities, villages and school districts leverage the ClearGov Insights™ platform to operate more effectively and efficiently. ClearGov transforms civic and school district financial statements into accessible, easy-to-understand infographics to help citizens better understand how their tax dollars are being put to use. Local governments use ClearGov’s SaaS solutions to reduce operational inefficiencies, make informed budgetary decisions and improve communication with citizens. ClearGov announced today a new feature that allows clients to easily create a branded transparency portal. Local governments now have the option to add a community photo and seal at the top, all while still utilizing ClearGov’s infographic dashboards for financial and demographic analyses. The custom-branded portal is made available via a private sub-domain of the ClearGov site. 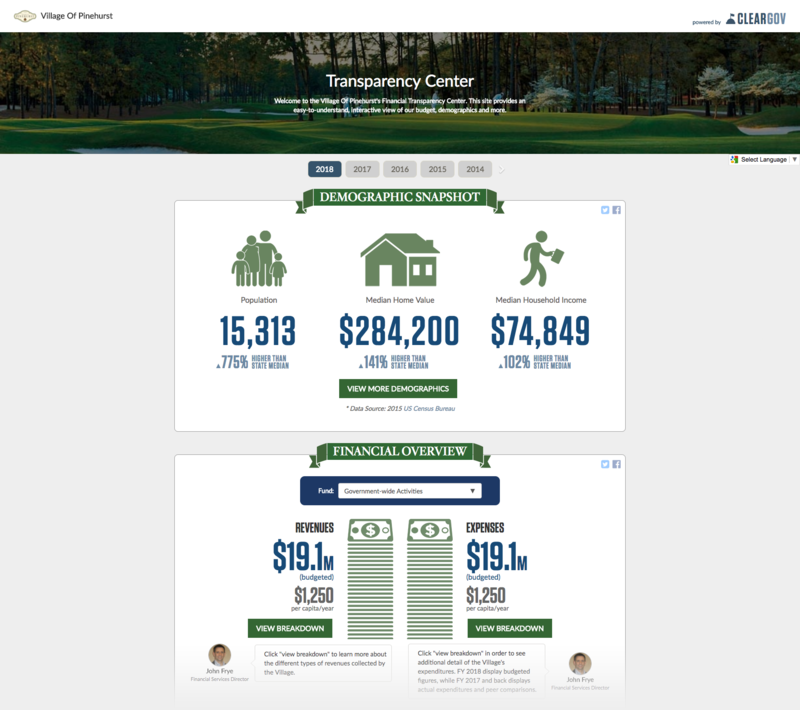 The Village of Pinehurst, NC, is the first ClearGov customer to take advantage of the new branded transparency portal feature. Check it out via the link below! Hopkinton, MA (5/17/17) – ClearGov, a leading municipal transparency and benchmarking platform, has announced today that its network of municipal transparency profiles now covers all fifty states. Over the past two years ClearGov has gathered financial detail on over 36,000 municipalities to create the world’s most comprehensive municipal financial database. The ClearGov Insights™ database now includes over $2.4 trillion in government spending across hundreds of budget categories. The ClearGov team has painstakingly gathered data sets from hundreds of open data portals and FOIA requests and combined them via a unique national chart of accounts. Through ClearGov’s benchmarking algorithm, visitors can easily compare cities and towns against similar communities and gather powerful insights into local spending. Government leaders are also mining the ClearGov Insights™ database to make more informed and data-driven budgetary and policy decisions via intuitive benchmarking tools. ClearGov today launched a comprehensive analytics solution for school districts. The new ClearGov Insights™ for Schools platform enables school districts to better communicate with their constituents through easy-to-understand, interactive infographics on student demographics, staffing headcount and salaries, student test performance, district financials and much more. The platform also empowers district administration with back-office tools to quickly compare district performance against similar districts to identify opportunities for efficiency and make more informed and data-driven budgetary and policy decisions. “Building public support is critical in today’s society. There is so much data on schools available to the public that it is overwhelming for the average parent and taxpayer. Telling our district’s story in a clear and compelling manner can help proactively address the public’s increased appetite for information and get everyone on the same page,” said Michael Welch, Superintendent of Dedham Public Schools. In addition to Dedham Public Schools, twenty school districts across Massachusetts, including Easton Public Schools, Framingham Public Schools, and Wayland Public schools are now leveraging the ClearGov for Schools platform for increased transparency. Utilizing publicly available data from the Massachusetts Department of Elementary and Secondary Education (DESE), ClearGov has created easy-to-understand transparency websites for over 300 school districts across Massachusetts, which are available to the public for free today. Taxpayers can not only compare expenditures for districts year-to-year, but also have the ability to break the budget down into specific categories of spending to see exactly how their tax dollars have been used. Detailed Funding & Expenditure Analyses: Allow visitors to “drill down” into funding and expenditure subcategory details. Student Body Analysis: Offers insights into changing student demographics, including enrollment trends, high needs students, student diversity, and more. Employee Analysis: Informs visitors on trends in staffing with a particular emphasis on educators. Test Performance Analysis: Communicates complex test scores in an easy-to-understand format with powerful benchmarking metrics. State Aid Analysis: Provides a comprehensive view of state funding sources, including Chapter 70, Circuit Breaker and more. “Education spending can comprise a large portion of municipal expenditures and there are many factors that drive school district budgeting. ClearGov for Schools helps school districts better communicate not only financial and test performance, but also the ever-changing dynamics they must consider when budgeting,” said Chris Bullock, CEO of ClearGov. In addition to providing the public access to easy-to-understand financials, the platform also provides a set of benchmarking analytical tools to assist district and school administration and school committees in making more informed policy and budgetary decisions. “Data analysis and benchmarking have become a critical, yet arduous component of our budgeting and planning process. ClearGov for Schools delivers time-saving analyses and powerful insights for our administration,” said Dr. Andrew Keough, Superintendent of Easton Public Schools. ClearGov Insights™ for Schools is currently available in Massachusetts and will become available in additional states in the near future. The Village of Rye Brook announced today that it has partnered with ClearGov to launch the state’s first infographic-based fiscal transparency center. The new tool provides taxpayers an easy-to-understand, visual breakdown the Village of Rye Brook’s budget and financial history from 2011-2017, including insights into the village’s demographics. The site also informs visitors on how each budget item compares to neighboring municipalities for the period 2011-2014. The Village of Rye Brook is the first municipality in New York to leverage the new ClearGov platform, which also showcases basic profiles of every municipality in the state. The Village has added detailed revenues and expenditures breakdowns of its General Fund, as well as the Capital Projects Fund. “In todays society the public interest in seeking information online has increased dramatically. The Village wanted to get ahead of the curve by not only making our budget more accessible, but also to present it in a way that makes it easier for residents to get information about the Village’s finances,” said Rye Brook Mayor Paul Rosenberg. “It was also important for the village to provide context to this information by sharing how our finances stack up to other similar villages, towns and cities in the area,” he continued. ClearGov sources publicly available financial data on municipalities to create easy-to-understand transparency websites for over 20,000 municipalities across the United States, which are made available to the public for free. Municipalities can choose to upgrade and enhance their publicly available transparency site with more robust information and provide context through commentary on the figures.